MetaTrader 4 is the most widespread trading platform amongst Forex brokers and it is also the most popular software for Forex traders. Admiral Markets was one of the first brokers to introduce this software to its retail clients and since then it has never regretted this decision. MetaTrader 4 excelles in many fields when compared to other trading platforms. The main advantage of MetaTrader 4 is its reliability and stability. Unlike many other platforms that have been around for a few years with a limited amount of traders and trading volumes , MT4 has been in use for over a decade with hundreds thousands of users. Due to this, the platform has been tested and improved over many years, so it is quite unusual to encounter any bug in it now. In particular, this platform has been quite popular for Windows users, as it is available for nearly any version of this OS, ranging from MT4 for Windows XP to MetaTrader 4 for Windows 8. Let’s find out about the useful features of this trading platform below! MT4 has lots of benefits in addition to its stability and historical performance. This is a superior trading platform suitable for almost any type of a trader. When you are using an MT4 Windows version, you are supplied with a great deal of technical indicators and tools for advanced analysis. MetaTrader lets you add over 50 built-in indicators, oscillators and tools for determining volumes. It does not limit you in terms of the amount of indicators you can apply simultaneously on a chart and it also allows you to fully customize the periods used on indicators. Allowing you to set up an analysis that directly matches your trading strategy. In addition, with MT4 you can go a bit beyond regular technical analysis on the chart and see useful data off the chart. With MT4 you can observe your current exposure, this is especially useful for those traders that have positions in several currency pairs in their portfolio at once. MT4 on Windows 8 and on previous versions of this OS lets you use lots of graphical objects to improve the appearance of your chart. Usually traders use a regular line object to draw support and resistance lines, however you may go far beyond this with the graphical tools offered by the MT4 platform. Also, using MetaTrader 4 Supreme Edition you can access additional types of orders, such as OCA or one cancels another type of order. This orders are in particular useful for advanced traders. As an advanced platform, MT4 lets you also place Stop Losses and Take Profits. In addition to its great flexibility in terms of order types and powerful technical analysis, MT4 is actually quite intuitive and easy to use. It is very handy to be able to place your orders via 1-Click-Trading tool, especially if you are a scalper. Many platforms also limit you in terms of the active charts you can run. This will not be an issue when you are using MT4 for Windows 8, 7, XP or any other version. As well as all these useful features to aid your trading, you can actually get access to some indirect trading items. 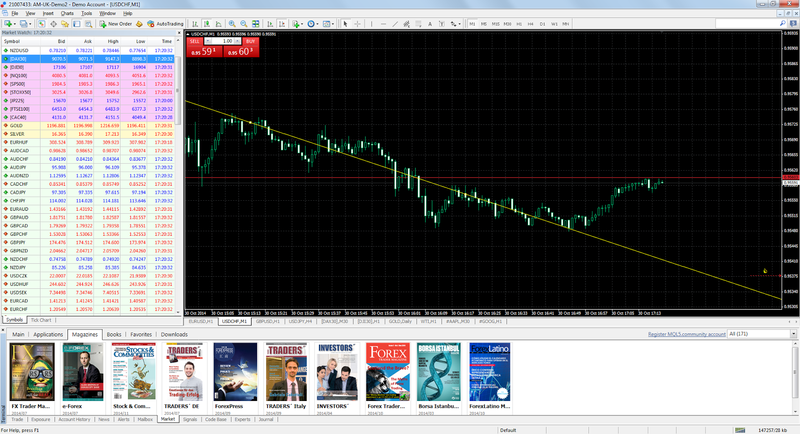 For example, you can get trader’s magazine right from your MT4 trading platform interface. MT4 is a great platform for manual trading, yet it also excels when it comes to automating your trading strategy. MetaTrader uses EAs also known as Expert Advisors that are built using the MQL programming language. This means a trader can either make his own trading robot that will automate a trading strategy or indeed create a new custom indicator that extends the scope of existing indicators. There are many more advantages available to traders who use this trading platform, those described above however are the major ones. How to install MT4 on Windows? It is quite easy to install MT4 when you are using a Windows computer. The first thing that you need to do is to download a MetaTrader 4 installer, which is an .exe file. Once you have downloaded the installer, you would need to open it and an installation wizard window will appear. The installation of MT4 software is not really any different from installing any other Windows program, you would need to choose the installation path, agree to the terms and conditions and select where you want to have your MT4 installed. 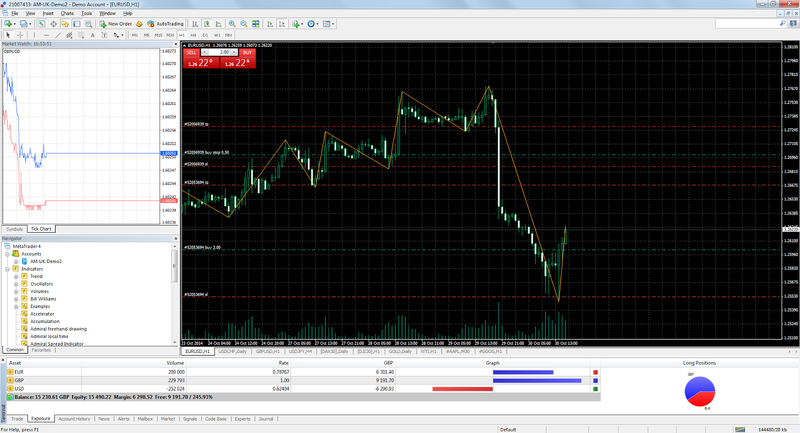 It is best to avoid installing MT4 at Program files, as sometimes it may misbehave in this location. 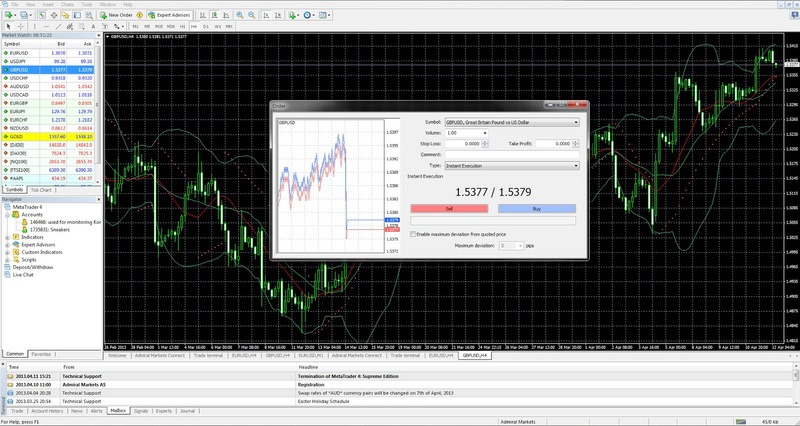 At the end of the process you may select whether you want to add MT4 to your desktop and other locations. After you have successfully installed your MT4, you would need to type in your account credentials. Do not postpone this for later, get your hands on the industry leading trading software now! Click on the icon below to download MetaTrader 4 for Windows! After you installed the platform and opened a live or a demo account with Admiral Markets, you will be able to trade over 50 currency pairs, lots of CFDs, metals, oil and more. With Admiral Markets you can also get an enhanced version of MetaTrader 4, exclusively available under the name MT4 Supreme Edition. With this update you will get an enhanced version of 1-Click-Trading, integrated correlation matrix and market sentiment, new types of orders and much much more.